SEONGNAM--(Korea Newswire) February 07, 2014 -- Anritsu Corporation is pleased to announce the company’s ME7873L RF Conformance Test System has become the world’s first GCF-approved mobile test system to achieve more than 80% of test cases supporting the LTE-Advanced(Note) Carrier Aggregation. The LTE-Advanced standard is the latest 4G high-speed mobile standard now being deployed by global network operators, following the 2013 start of the first launch in Korea. Test systems must obtain GCF approval for at least 80% of test cases as a condition for terminal certification by GCF. 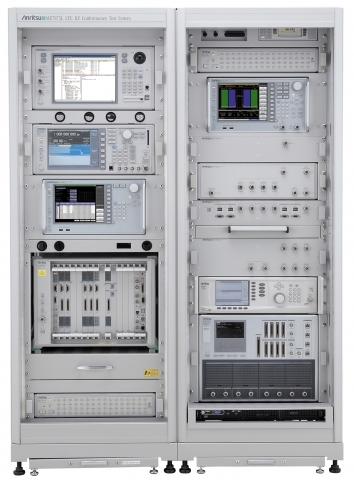 Anritsu’s ME7873L RF Conformance Test System achieved first GCF Carrier Aggregation approval in October 2013 followed by additional certification for new test cases by CAG in January 2014. As a result, it is the world’s first test system supporting RF/RRM conformance tests in Band 1-5 and Band 3-8 with 80% of GCF test cases. Global network operators are deploying LTE-Advanced from 2014 onwards, creating an increasing future need for conformance test systems. Anritsu will continue to focus its efforts on obtaining GCF/PTCRB(*5) certifications to help bring next-generation mobile broadband systems to market as soon as possible. This is a test platform supporting LTE terminal compliance with 3GPP standards for RF Tx and Rx characteristics, performance, etc. It supports the LTE/LTE-Advanced technologies and is used widely for mobile carrier acceptance tests in North America and Japan.